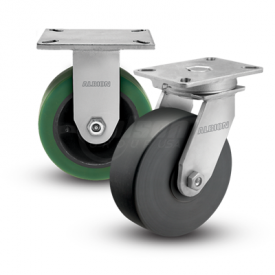 Albion 94BBL Super Duty Casters utilize a ball load swivel section. 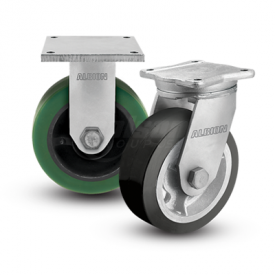 The swivel load raceway uses a 5”-diameter ball load race with 1/2″ steel balls hardened for greater resistance to wear and brinelling. The raceway is protected by a forged labyrinth skirt. The thrust raceway uses a 1-1/4” tapered roller bearing. 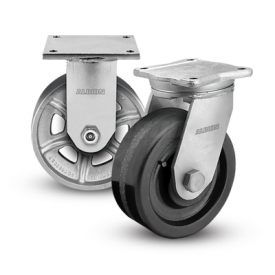 Combined with AISI 1405 drop forged steel top plate and yoke base, 94BBL casters have a long life with large weight capacities, perfect for very rugged applications. Interact and Download Native CAD models below. Rotate, zoom in/out, and see critical dimensions by utilizing your mouse. If you have found parts you are interested, Request a Quote and specify those part numbers.